It was said on the cover of LIFE magazine that 1968 was an "incredible year" filled with events of immense historic significance. I have a CBS record celebrating the same. In hindsight, Western history had reached a tipping point. I have been going through a suitcase of my fathers' papers lately. In it there is a file on a conference on Teamwork in Design sponsored by the Council on Industrial Design [now the Design Council] that he attended, held in Edinburgh on Friday June 28, 1968. Design, the journal of the CoID, said back then: "the conference is aimed at management executives, designers and educationalists... Speakers will include representatives from each of the six companies which have won this year's capital goods awards, who will talk about the design problems in their particular industry; and plenty of time is to be left for discussion. The chairman is A. R. Miller, who was also chairman of the ColD Awards capital goods panel." In the file there are several rounds of correspondence between bureaucrats at County Hall and my father about his claim for travel expenses which had been initially agreed to be limited to £20 but when all overnight trains were cancelled because of a national railway work-to-rule, he was forced to fly to Edinburgh. The extra costs, including airport parking - which he could only claim reimbursement at the equivalent of the bus fare to Heathrow - had exceeded the stipulated budget by £4 which he was not willing to bear. I wonder if there is any database of UK industrial action; of who and when and for how long particular companies or whole industries were on strike? The following weekend was my seventh birthday party where I got an 'Action Man' figure and discussion about the cost of it was the first inkling I had my parents were worried about money. Perhaps my dad was feeling rather short, being considerably out of pocket because some other working stiff felt they deserved more money for their labour too. A topic of conversation my father was fond of then is still unresolved now: there is little point in innovation of the machinery of production unless we also innovate the role of 'man' in such production. I don't recall who said it but I heard on Radio 4 recently that there hasn't been a major step change in management since Taylorism. What might be fascinating to the casual web-surfer landing here is the travel ephemera I also found in the file. There are certainly many people who collect this, the BEA timetable below is already on the web. Flicking through the 'Official Accommodation Register 1968' of Edinburgh gives an insight into the lost world of theatrical landladies and rooms for rent in private houses for working men and commercial travellers along with two establishments styling themselves with the novel Americanism of 'motel'. I imagine such things are invaluable to anyone writing historical fact - a thesis on the history of travel promotion? - or say crime fiction set in Edinburgh at this time. There was a landlady on Clarence Street called Mrs I. Love, I wonder if that caused a titter? The Misses M and K Canning of 94 Lothian Road sound like genteel respectability, were they middle-aged spinster sisters forced to take in lodgers? Although much too tedious for me to do, plotting the location of every hotel and room with its prices in the city (and if other registers can be found; over several decades) might produce some interesting economic insight. I wonder at the cause of disparity of prices for bed and breakfast in private houses. In 1968 Mrs Fleming of 3 Grindlay Street officially offered the cheapest B+B in Edinburgh offering her two rooms for 12/- per night low season when only three other establishments went as low as 12/6. At the other end, Mrs Maran of 24 Kingsburgh Road presumably got the 25/- she asked for one room B+B year-round when good hotels offered full amenities for 22/6. Was Mrs Fleming's neighbourhood at the foot of the castle a den of inequity? Mrs Maran's was presumably then a leafy well-to-do neighbourhood like it is today. Do travellers to Edinburgh have more beds to sleep in now? Are they cheaper and more conveniently located? What has happened to those houses since and where are these people now? If you think your ancestors might be listed, you can get in touch with me to look them up or even better, suggest to your local media they follow this up as a feature. I don't know where else could you find any lists of Edinburgh's landlords and landladies. It seems you have to go to Australia to access another copy of this register and subsequent editions. The 18-room Dunraven (proprietress Mrs Caldwell, high season rate 20/- per night) doesn't appear to be a guest house today and there is now a fence between number 5 and 7, the two halves of the semi-detached property. The Sixties were called a 'sexual revolution' where the role of women in society was redefined (somewhat) towards equality. Then the gender semiotics of the BEA timetable invites discourse; here the female is placed in a subservient position to the male, who has a surfeit of authority and status symbols, while she is symbolically loaded for both nurturing and protection? Old time-tables are a great resource for transport historians/enthusiasts looking to say when a particular service or aircraft was introduced. Real price inflation data is hard to come by so these can be a resource for this too. I know that in 1968 my mother was a very junior draughtsman earning £14 per week, so a round-trip flight on a standby ticket exceeded a week's wages. I don't think a draughtsman in an architect's office would need to spend a week's wages on a flight to Edinburgh today however, if a room in a decent B+B was 20 shillings (that's £1 in new money), then I reckon at £60 today, they are more expensive now than they were then. I remember seeing these BEA airport buses towing their luggage trailers passing our house so on this evidence their fare was 7s 6d. When BEA and BOAC later merged to form British Airways, they reasonably had no need for two London terminals (BOAC's was opposite Victoria Coach Station) for passengers to check-in. The debate that followed when BA then tried to close BOTH terminals occupies reams of Hansard. It seems road congestion would delay the buses and so the aircraft departure because its passengers were already checked-in. BA moved to have everyone check-in at Heathrow. The opposition cited the already congested facilities at Heathrow and the common sense behind being able to conveniently check-in luggage in central London when there was no rail link to Heathrow then. The terminal on the Cromwell Road is listed and has been converted into Sainsbury's supermarket. This BUA timetable invites comparison to the BEA one. 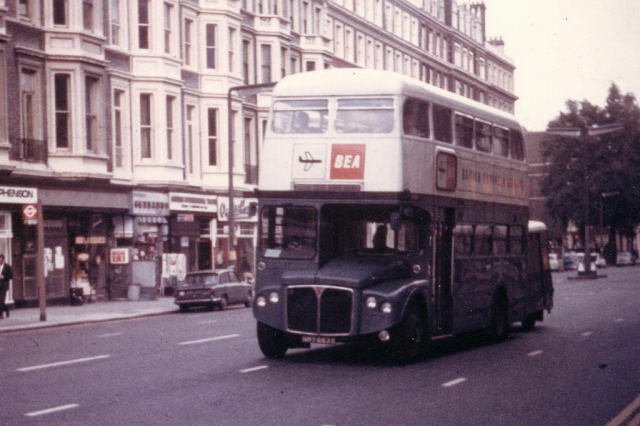 While the fares were exactly the same, BUA was at an interesting time in its history, being thought of as the second tier after the flag-carrying BEA and BOAC. By 1968 its original MD, Freddie Laker, had moved on to form his own airline and BUA was in financial trouble after investing too much since his departure in improving service, reliability and promotion which had improved their share of the market but not improved their profitability. The following undated text by Geoffrey Bocking was typed and handwritten on torn-up architectural drawings, some of which are marked 'Tregothnan North-West Wing - Kitchen for Viscount Falmouth'. The word 'Tane' appears as a title on several pages. I have attempted the best I can to piece together the intended narrative of evidently an unfinished work. As anyone knows who has done any market research, the kind of answers to be got from even the most skilfully phrased questions depends very much how they are asked and in what circumstances. If the purpose of the research decides what questions are asked, and how, when, and where they are asked; who asks them and who replies must all be taken into account in considering the answers. Especially this is true in dealing with people in an attempt to predict how they will behave in a future situation. But many of the pitfalls which are encountered in direct questioning are still to be met with at second-hand in any enquiry about human behaviour because subjective experience in necessarily one of the principal sources of information. Our purpose in this enquiry is to try to throw some light on how our surroundings are created. In the broadest sense, they are the material result of man’s struggle with his environment and the questions we shall have to ask will, therefore, be about the nature of man about the forces with which he struggles. But obviously if we are to thread our way through so immensely general a subject towards a useful and informative result with any pretence to accuracy we have to take care to ask the right questions in the right places. We need to adapt the techniques of our enquiry not only to the particular subject matter as it exists in the concrete reality of time and place but also to the type of concept we are looking for and to its place in the field of conceptual reality. Thus the kind of objective truth that scientific research seeks is manifestly in a different category from that revealed, for instance, in spiritual ecstasy or, more mundanely, from that perceived in musical harmony or mathematical logic. Yet as a motive for human action each may as powerful as the other and result in equally great changes in our material surroundings. Since we are trying to find out what causes these changes we cannot afford to neglect one kind of truth for another and must adopt any line of enquiry which promise to throw any light on them. But in deserting the authentic techniques of scientific research we also leave behind the traditional safeguards which science has built up to test the validity of its findings, and must perforce seek new ones. Further, if we are to interpret our results as a useful guide to the shape of things to come, we are faced at some point with the necessity of making value judgements of them. Fortunately, since what we are principally concerned with are the processes by which man creates his environment and not with their reform, much of our basis can be pragmatic and the technique of our enquiry directed to what happens in fact rather than to what might happen under different circumstances. A convenient way of studying man in his material environment is from the point of view of the ecologist. Ecology (oikos, abode, habitat) is the study of animals and plants as they actually live in their surroundings and it takes into account everything which affects this living process. Thus, not only is the plant or animal; organism itself studied and its properties, construction, growth and reproduction described and analysed, - but equally the environment and climate in which it lives are subjected to a like scrutiny and enquiry. More important still the ways in which the organism and its habitat interact so as to produce whatever situation is found to exist at the time of observation are given special attention. It is essentially a field science rather than a laboratory one – concerned more with things as they are naturally than with how they may be under special conditions. For our purpose, its particular virtue lien not so much in its technique but in the way in which it focuses attention – emphatically and continually – on what happens in reality as the starting point of enquiry and the criterion by which to judge the truth of its findings. Ultimately, however intrinsically interesting the facts we find out on the way, this is what we want to know if we are to predict the next stage of development. Man is, of course, in a special category. All animals modify their environment to a greater or lesser extent but man is unique in doing so consciously and in response to motives of which, too, he is more or less conscious. Furthermore – and this is what especially concerns us here – man is now entering a stage of development where the material environment is not just the natural one modified but one which he has built-up from scratch. In terms of human ecology, therefore, the three basic subjects of study: the organism, its habitat and the interaction between them – must be enlarged to take account of man: the ‘builder and constructor’ and environment: ‘man-made’. And as a builder and constructor, creative man is subject not only to his material environment but, because of his consciousness, to the cultural environment of his time. What he builds depends in part on material considerations and factual motives which can be studied and analysed in the same way and using the same terminology as we would use in a purely animal ecology but the mental concepts and formal images which play such a large part in human activity require a different technique. Like instincts and other motivating devices they can only be studied in the actions which they stimulate and the material effects they cause but are quite distinct from them in the sense that they have a conceptual reality - an immaterial form and substance - which can be visualised, delineated and to some extent communicated. Thus for instance we may study the nest-building activity of birds by looking at the different forms of their nests and speculate usefully about the instincts by which they are motivated without having to consider the effects of any mental picture of a nest which a bird might have, since for most purposes we need not endow birds with this form of consciousness. But the case is quite different for man. The formal images and verbal concepts which form a large part of man’s consciousness of reality play a major role in determining the form and organisation of the things he builds. In the same way as we can associate such and such a form of nest with such and such an instinctual drive operating under such and such conditions, so too with man, we can identify particular building forms with particular mental concepts (as well as with other motives which man shares with animals). But these mental concepts are not constants to be found substantially unchanged from generation to generation. They depend among other things on the particular cultural environment of the time. So too there may be said to be an ecology of man on his cultural environment which parallels that of man in his material environment. Its viewpoint remains the same; only its technique and terminology need adaptation. So much for man. Similarly, our surroundings and the changes they undergo as a result of natural forces may be studied as an ecological problem. From this viewpoint, man himself is bit one of the many natural forces which cause these changes – of little effect in virgin jungle by no means the sole or even the principal force operating in a man-made environment. Whether we look at the topography of an entire region, the layout of a village, or the weathering of a cornice, we see a continual process of change, of growth and decay, which is the proper course of ecology to study. And in this application we are not faced with the necessity of taking man’s consciousness into account. Since we are concerned with the forces which cause change, it is changes and the forces that cause them, it is not necessary to make any distinction in kind between those which have a human origin and those which do not, nor to enquire into human – or to that matter any other – motives. To take an extreme example, it is sufficient to regard the House of Commons as the result of, inter-alia, ‘force’ of Gothic Revival in the same way we regard an outcrop of rock as the result of the forces of the wind and weather. The fact that the former is the result of a human agent building for human motives and with a picture of ideal Gothic form in mind is irrelevant here. Needless to say, what we neglect in this application of ecology has to be studied in its application to man but this is only one illustration of the importance of asking the right questions in the right places. The Gothic revival as a concept belongs under the heading of man; the visible form of the House of Commons, like the shape of trees or the course of a river, belongs under the heading of material environment. From the viewpoint of ecology, each particular instance is best studied in its own appropriate environment: the Gothic Revival in that of man’s culture; the House of Commons in that of buildings generally. The necessity of studying any topic in its proper context is of course sufficiently obvious without dragging in ecology to justify it, but in practise we find again and again that where a topic has several contexts – abstract and concrete, conceptual or realistic – the attempt to take a synoptic view leads to a confusion of different kinds of meaning. Or where one context only is scrupulously attended to, the findings are in such splendid isolation from those obtained in different contexts as to frustrate any attempt to relate them into a coherent whole. The semantic problem this raises and the difficulties of effective communication between different intellectual disciplines with which it is associated are immense, and cannot be solved by any simple choice of approach or viewpoint. The most that can be expected of the ecological point of view selected is that it should, firstly guide us to asking the right questions in the right places and secondly provide a unifying form of presentation well adapted to the kind of information we are seeking. What we want to know – how our surroundings are created – is a process. A descriptive system capable of integrating many different kinds of action and interaction on a restricted but varied range of materials is to be preferred to an analytic system attentive only to specific kinds of action and pre-determined methods. For any process to be comprehensive we need to know something about how processes in general operate and, more specifically what we are dealing with, we need to know the context. In fact, if we are to speculate usefully about the new environment now being created at the present, we need to know how the process operates. For any process to be comprehensive, we need not only a description in words but some form of pictorial representation with which to supplement it. Verbal imagery, the conjunction of sign and symbol in a diagram and frequent reference to the scale of things are all essential aids. Furthermore we need context; an understanding of how processes in general operate and more specifically what kind we are dealing with here. And finally, we need to define it carefully because we are dealing with a process which although in itself provides the background to everything we do; in itself it is a small part of human activity. I found this in some papers of my father Geoffrey Bocking that have recently come to light. During the protest at Hornsey College of Art in May 1968, he was a Senior Lecturer in Design at Hammersmith College of Art and Building. It is noted by several authors that along with his close friends (and rivals) Norman Potter and Anthony Froshaug with others, he was very influential in determining the form of education for designers. It is evident from the papers I have put here and here that these questions had occupied him for more than a decade previously. According to Nick Wright, the peripatetic visiting practitioners accorded Hornsey status which I surmise Shelton naturally wished to protect. The shrill trumpetings of Harold Shelton [principal of Hornsey College of Art] have gone on so long now outside the city walls of London and they become more and more amusing. The wild and woolly provincials beyond his demarcation line of Coventry, Birmingham and Leicester can be heard giving vent to vulgar belly laughs in their caves in the hills. As Shelton struggles to decide what provincial borough he really belongs to, he also is striving desperately to crawl beneath the gates of the big city. He dearly wishes to align himself alongside the truly traditional London Colleges who lightly wish to preserve their own identity. Outside the gates he marshals his secret band of professional artists and designers the like of whom exist apparently nowhere else in the world if his argument holds good, let alone in the North of England. When he plots his demarcation line he forgets the educational armies in other countries with more enlightened views. My own experience after teaching for some years in two of the main London Colleges is that there is a great weakness in a preponderance of visiting part-time specialists. This adds to professional techniques but weakens the concerted overall educational policy. It is certainly a fact that artists and designers converge on London from all the provinces, but it is also clear that educational ideas often emanate from outside London. We can really ill-afford to neglect the overall contribution of different environments within such a small country for we need to work on firmer ground than for instance Carnaby Street, Bond Street and the Royal Academy if we are to achieve something that is Nationally worthwhile. Unconsciously however he may have struck a very good idea. A North versus South, all holds barred, kid gloves off battle tickles me no end for it could well lead to the deeper thinking this Polytechnic problem deserves but is not getting because of petty individual difficulties clouding the issue. And he might also get rid of a lot of the cant and humbug that has put Britain in its present difficult position if educationalists and designers all over the country got together. This is surely a national educational problem. The trouble is that artists and designers have preached so-called efficiency, collaboration with industry and educating the consumer for years but when they are actually faced with the problem and the hard facts there is immediate withdrawal into their normal isolationists' unrealistic little Bohemian empires. The greatest fear says Shelton is lack of identity and individualism. This is certainly lost by weakness but the DipAD developments have created an entirely new situation from that in the past. Art Departments in the old Polytechnics used to be swallowed up by larger ill-informed Technology Departments and they really asked for it with the sloppy approach to art and design that existed at that time. The problem still remains however and we are not solving it anywhere by backing away. Are we forgetting that we've traveled a long way since the early failures and that technology is now in a better state to attempt inter-disciplinary education. With the strength gained by DipAD we could now achieve a tremendous advance if only we can tackle the matter rationally. When the combining of all resources is an inevitable step that we must take for the betterment of education generally however difficult it may be, surely it is wrong not to get to grips with the matter now rather than wasting our time carping over personal difficulties. Eric Taylor’s scattered broadside hit upon at least one target against which I too should like to loose off a few rounds: the weakness inherent in a preponderance of visiting part-time specialists. The notion that a successful design course can be run by relying on the peripatetic visitations of active and up-to-the-minute practitioners deserves to be exposed for the nonsense it is. The last thing working designers have time for, immersed as they are (and must be if they are to be of value to students) in the day to day running of busy and successful practises is the contemplation and reflection – as well as the objective study – needed to formulate an educational programme. This is the job of the pedagogue, the expert who because his principal concern is education and not practice, can devote a sufficiency of time to devising, organising and running courses that will properly prepare students for practice. Charmingly nostalgic as the renaissance idea of ‘apprenticeship in the studio of the master’ is, we must recognise that in this age it is no more than an indulgent euphemism for ‘sitting with Nellie’ – a mode of training even the most backward industry finds adequate. What is urgently needed today - a need well recognised in the Polytechnic white paper, incidentally - are methods education and training that will better equip students practise than – let’s face it – the inept irrelevances with which most of today’s practitioners were themselves surfeited – relics of once-noble craft traditions served up in the mould of sterile academicism. Peripatetic visitation, part-time heads of department and all the other devices for totally immersing students in day-to-day practice does not meet this need. Educational establishments should certainly not, for this purpose, be ‘groves of academe’ – but nor should they be pseudonymous workshops, in which students are encouraged to ape the working methods of their masters. Design schools if they are to do their job must face up to the fact that they are concerned with a comparatively new and still emergent discipline. We are as yet far from being able to say: this is what design is; and until a lot more objective study and hard thought has been given to it by men able to stand at the right distance, empirical methods will no doubt have to continue in service. But let them be methods based on some deliberate assessment of what design is about. Here again the active practitioner is badly placed. He will tell you what design is – it is what he practises – and of course he is right, so long as we recognise that what each practice is no more than an aspect of a very much larger whole. But ask him what the whole is and in the rare instances where get a complete answer, you will find some remarkable lacunae in its conceptual structure. So when practising designers come together, as presumably they did to formulate, for example, the Society’s Policy for Design Education you may expect to look in vain for even an indication of what the content of design education should be, although admittedly there are usually some pious platitudes about the need for such content. This gives teachers – men skilled in preparing students for, inter alia, a working life, precious little to get their teeth into. It is hardly surprising that academicism is still for some a convenient refuge. There is, as Eric Taylor advocates, a pressing need for educationalists and designers to get together. But if they are to do so fruitfully, busking designers must recognise that more will be asked of them than an admission ticket to their working lives. If, as I contend, design is a discipline - albeit an emergent one – it is worthy to be taught differently from, say shorthand and typing at a level consistent with an honours degree. And what design course in the country can claim it has this in view when even architecture, a recognised discipline of which design is the very stuff, has yet failed to get C.N.A.A. approval? Perhaps if designers were more secure in the knowledge of what they practice, they would have far less fear of its being contaminated by technology? The best and quickest way of training more scientists has become top priority for the Western democracies since the sudden dawning of Sputniks 1 and 2. At first sight, this seems logical enough. Scientists in Russia are a favoured class and are being trained there in vast numbers. But the fact is that launching a satellite does not call for any fundamentally new knowledge such as a scientist discovers. It calls, rather, for a spectacular concentration of effort to put to practical use facts of scientific if not common knowledge; a technical achievement of a high order but not a great discovery. On a short term basis more technicians - not more scientists - are the most urgent requirement. In the long run, however, both would be needed. The facts that the technician makes use of are provided by the pure scientist and, in a country like Britain where limited resources prevent full exploitation, the only way to keep ahead is always to be finding out more and more facts. Of course, facts are inevitably turned up and new lines of research suggested by technical exploitation, but the kind of person who spends his life in search of what is called 'Pure Knowledge' and the one who puts it to use are basically quite different. Lingering popular prejudice for the practical man in preference to the idle dreamer probably accounts for their differences being minimised in any popular discussion about their education but,when the need for both is urgent, much time and money can be wasted if essential qualities are overlooked. It is quite true that the scientist searching for new knowledge for its own sake must have something of the dreamer about him - but it is far from being idle. Like any other craftsman he needs a high degree of skill and tools of the finest quality. The material he works with are facts - pure and simple and as accurate as possible. The first part of his work therefore, is to get hold of these facts by research and experiment. Having got them, he treats them as if a dog with a bone had been crossed with the curator of a museum. Worrying away at them and even in the end having to put them aside for another day is one way of working; another is to potter about with them looking at all sorts of other facts to see where they can be fitted in. In each case, what he is seeking is fundamentally the-same things a way of relating them to what he knows already, of fitting another little piece to the jigsaw puzzle, or in other words - a theory. Archimedes who sprang from his bath with the cry ''Eureka"; I have it, is the well known example. And, incidentally, his theory when put to practical test proved sound although two thousand years had to elapse before checking theory by practical experiment became standard practice. Democritus, for instance, who hit on an atomic theory never dreamed of trying it out in practice or he would not have been so lamentably wrong in detail: 'acid taste, for example, is produced by atoms which are angular, winding, small, and thin' is one of his amusing speculations. Nowadays devising practical experiment's to test new theories is an important part of the process of scientific discovery. So, too, is the continual refinement of the tools the scientist uses - tools which start by being simply ways of thinking and finish up as intellectual disciplines in which every step is as rigorously controlledas the moves in a game of chess. Abstraction and generalisation are the two - basically opposed - ways of thinking that the scientist uses to get at the marrow of his bone and to see where it fits among facts generally. To the layman, they often seem curipusly roundabout ways of getting practical information. A few facts and the scientist is likely to disappear from reality for a long time before he finally surfaces with a new theory. And the theory, however practically useful seldom seems to have even the remotest connection with his starting point to the layman. But that is precisely the point. Although much - probably most - research is undertaken to find out something quite specific, nearly all theory is arrived at by speculationj by abstraction and generalisation brought to a fine art on selected facts. The technician wanting to know how to get to the Rose and Crown would be satisfied to be told that he should take the second on the left, the first on the right, and fork left at the church. But what would the scientist make of this ? If he were a topologist, he might reflect that in the the information he had just been given, nothing was said about distance or the bends in the road. So, he might say to himself,'provided I keep to the road, I don't have to know how far or in what direction and yet ultimately, I shall arrive at my destination'. Now for the 'abstraction': getting from anywhere A to anywhere else B need not depend on distance and direction provided only that it is done under a certain condition (keeping to the road). Thus far all he has done is forget all the practical details and look at the problem in the abstract but now he takes a further jump away from concrete reality by 'generalisation'. By applying various rules of thought (part of his training) he is able to surmise that his problem is of the same general character as exploring a maze, tracing the pattern in a piece of clothp unravelling A tangled ball of string, and connecting up a telephone exchange. And all the solutions to these problems were put into categories and worked out in a general way by scientists 150 years ago. Now to the problem of finding his way unaided to the Rose and Crown these solutions are of not much help to the topologist. The technician might be excused for dismissing them as a waste of time in this instance; he would be right. Topology has been until very recently only an interesting theory of severely limited application in practice. But in the purely practical job of making computers work - equipment essential to get a satellite into the right orbit, for example - topology has suddenly become indispensable. The 'idle' speculation on a few facts of everyday observation transformed by the highly skilled use of the tools of 'abstraction' and 'generalisation' into a body of knowledge of the most up-to-date practical significance. This way of treating facts is clearly quite different from that of the technician. Apart, therefore, from all the differences in training, one of the first requirements of any educational system is a means of distinguishing early enough between the speculative, abstract, generalising type of intelligence required of the scientist and the attentive, concrete, particularising kind of the technician. Both deal in facts in almost overwhelming number; both rely on persistence and intuition, and the ability to visualise; both-need each other's co-operation in solving problems. But to put them through the same curriculum would be a disastrous waste of effort. The manuscript of this article was amongst some papers of my late father Geoffrey Bocking MSIA [1919 - 1969] that have turned up in France. He submitted this for publication to the Architects’ Journal in October 1957 but it was rejected. According to the editor, the late Colin Boyne; "I am not sure the erudite manner which you present it puts your arguments forward in a manner in which they will be best appreciated by Journal readers..." To be fair, Boyne did offer to reconsider if it could be cut to half its length and written in "simpler and more direct terms" I have no evidence my father did. Our environment results form the ‘organic situation’ of man-versus-nature: it is a battlefield on which new forces are constantly being engaged and a matrix continually re-shaping the weapons with which they are countered. Characteristic of the present active phase is a physical environment full of constructed objects, man-determined; the material evidence of a temporary victory of the forces of man over those of nature. In contrast to former victories which have resulted principally in a modification of the natural scene, we are now entering a phase of transformation to a man-made environment, natural in so far as man himself is of nature. The chaos which this exhibits is a demonstration that the victory is an illusion far removed from the order which is man’s ultimate and true victory and a reminder of how little we know of the proper techniques for constructing it. To control the forces now operating primarily through man we need a new phenology to guide us, as in former phases man learnt to control the forces external to himself only when he began to study them. No superficial tidy-ing up is sufficient – a shifting of shards for preservation in the sterile air of the museum – for the present phase is an active one of gathering momentum. Order – the order of the living organism – can only come through control based on understanding of the forces which now operate through man within his man-made environment. It is obvious that the role of architecture in this task should be a prominent one, for architecture is concerned with the practical disposition of constructed objects (in its widest application, with the enclosure of space) based on a theoretical understanding of the forces which determine their construction and arrangement. In fact, modern architecture is very far from fulfilling the responsibilities of this role: of ‘what-gets-built’ – the constructed objects of our environment – architects are responsible for a proportion estimated between only 5 and 25% of the theoretical background; modern architects have chosen to concentrate on only two aspects. Intensively studied have been the aesthetic/engineering problems of structure and materials (with the result it is now structurally feasible to build in almost any shape that can be conceived and in any material) and the social/economic problems of planning (the accommodation of an entire working community is now functionally and financially practicable). But of the other forces operating in our society there has been an almost total neglect and it is worth considering whether this is the cause of the comparatively small architectural contribution and of the public indifference to its achievements which this reflects? Of itself, public indifference does not necessarily mean a crisis for modern architecture nor need it imply a misdirection of effort. In fact, both the remedies for this situation which are usually proposed – a propaganda campaign and/or the bringing of all building construction under architectural control – take for granted the validity and appropriateness of modern architectural practice. But, as we shall see, both are nostrums: public indifference has roots deep enough in the structure of our present society to withstand such selective weed-killing or drastic cutting-back which, if we examine them, will disclose the true nature of the crisis which is yet to come. Implicit in the supposed need for a wider advertisement of modern architecture is the assumption that a larger section of the public does not like its looks but can be educated to do so. A similar educational purpose underlies the SUBTOPIA campaign: the public is blind but can be taught to see. Neither campaign appears to question the primary purpose of modern architecture is to produce an environment that looks well (although most architects, if asked, would immediately qualify this by emphasising that it must first work well). Nevertheless, a pre-occupation with the look of things only confirms the view held by the large section of the public whose sole contact with architecture occurs when it objects to the look of what they are doing and seeks to prevent them: fun-fair proprietors, road engineers, private householders, &c. It is a point of view which is further re-inforced from contact with such permissive organisations as the Council for the Preservation of Rural Erewhon whose principal intention – the preservation of the old – is divergent from that of architecture – the shaping of the new. By choosing to fight its battle of the issue of ‘the look of things’, modern architecture has become its own worst enemy for, as the SUBTOPIA campaign has demonstrated, this is seldom the first concern of those who build. The objects of our environment are constructed in response to other more urgent demand, and while these demands exist the public will remain relatively indifferent to the claims of any but those who can best satisfy them. To a generation held in thrall by the Lodoli-Sullivan spell ‘form is function’, this may not seem very important. They will protest that forms of the best modern architecture do genuinely reflect – in fact were generated only by – the function they serve, and in that it matters little in the long run that the public is indifferent to them. Apart from questioning the want of logic in trying first to sell the public something it does not want in an effort to get to buy something it does, this argument may be accepted in toto. The shape of modern architecture (or at least that of the best) does derive from the function it serves; the limited and inadequate functions arrived at from a pre-occupation with, on the one hand, problems of structure and construction, and on the other, pseudo-social problems of, for instance, circulation. But an architecture which seeks to constrain the office workers of Hong Kong and of Pimlico within an identical curtain-wall diagram, on the other hand, or fails to study the nature and relationship of man within a community, on the other, can scarcely claim that its forms derive from or are generated by the requirements of our society. Far from seeking to acquire that confidence which, as a first step, the proper study of the forces operating our society could give, modern architecture has taken refuge in a mumbling of formulae ‘functionalism’ ‘new brutalism’ &c and a rush to be the first to duplicate and re-duplicate each new form of iconoclastic shell or perforate wall, having an obvious parallel with the incantations and totem-carving with which primitive societies seek to placate a hostile environment. While there are obvious dangers in adopting an ostrich-like posture in the face of public indifference, it the fate of the dodo to which modern architecture should direct its keenest attention. Is his position as a designer separated from the processes of construction best adapted to the needs of present-day society? We need not argue the effects of such a separation on his abilities as a craftsman, since it is generally conceded that from this point of view they are harmful but we should examine the restrictions on his wider employment which result from it. Broadly speaking, there are three classes of persons that actually construct the objects that fill our environment: builders, engineers and private individuals. To each of these three persons the functional position of the architect is that of an assistant – he contributes a skill in design which assists the actual constructor. The demand in response to which these objects are constructed, the forces which compel their coming into being, may be – and should be – very much the architect’s concern but they never require that his particular skill must be exercised in isolation from the processes of construction nor, except by conventional precedent, that functional sequence should be reversed. That the architect occupies a position unique in our society is a traditional relic (“par cy me le taille”) now operating much to his disadvantage. Of the three classes of constructor cited, only the builder, by reason of the purely executant position to which he has been relegated by historic precedent, continues to respond effectively to a demand received at second-hand. And even his position, under the pressure of new forces, is changing more to that of an administrator, supervisor and organiser of ‘engineer-constructor’ – specialist subcontractors over whose actual techniques neither he nor the architect have more than an essentially permissive control. But apart from those over whom the architect retains a nominal control, there remains a large section of this class of ‘engineer-constructors’ who supply within themselves all the ability in design which they need to meet society’s demands and see no necessity, therefore, either to employ or be subject to architectural assistance. And for the last class – the ‘individual-constructors’ – where demand and fulfilment are largely co-incident, the only possible role – but one from which he is at present debarred by public indifference – is an assistant one. There remains one paramount filed of operation to which the unique and Olympian position of the architect would appear at first sight to be well adapted: the co-ordination of the activities of the three classes of constructor acting in isolation. This, however, brings him face-to-face with a problem which confronts present-day society as a whole: the elaboration of a technique of planning from diversity to unity. There is no doubt that to individuals the feeling of being planned for by an ever-present omni-potent ‘them’ is distasteful; nevertheless, no alternative, no effective technique of planning with, has yet been developed and in its absence, the conjunction of architecture with Olympian planning only aggravates public indifference into hostility. It is therefore very much a tribute to the real achievements of modern architecture that the New Towns – despite their comparative failure by the standards we have outlined – should have been accepted with equanimity. However, despite these partial successes in a limited field, the problem as a whole remains unsolved for it is unlikely and it would not be desirable that architecture should command such overriding authority generally. If it is to be solved, architecture must study as a first step, the techniques by which environment – not just the buildings nor even the ‘space-between-buildings’ is put together. (It was Clerk-Maxwell who suggested that “if you wish to understand the forces that control the motion of a body, the best method of approach is to learn exactly what the motion of the body is”). And as a second step, it must so adapt itself to the requirements of these techniques that its own can be fully employed. This requires that it should address itself not to the service of an illusory and insubstantial common good (on which R I B A practice codes lay such stress) but to the plurality of persons who actually construct the objects of our environment. When the average man looks to the architect as he now looks to the plumber the problem of how to plan with will have been largely solved. If this new ‘architect-plumber’ is somewhat far removed from the man whom the young student just entering the profession looks to becoming, the subjects he will have studied may provide further cause for dismay. If architecture is to fulfil its appropriate role: the orderly disposition of constructed objects in the light of the forces which determine their construction and arrangement, much of the purely technical material which forms part of the architectural student’s curriculum will have to be discarded. The closer integration of architecture with construction, far from demanding an even more fevered quest for the attributes of a Leonardo, a ‘homme universale’, will liberate a greater diversity of function. The student graduating in architecture may neglect with equanimity much of the theory and calculation of structure for there will be other graduates on hand – perhaps from the same school – to translate his oneric visions into reality (Candela not Nervi will be his god! ); the comparative study of historical styles and building types, hastily swallowed, and never digested, he will replace with the study of architectural iconography and of the ecology of buildings. From this he will come to know not only the people who lived and why they built what they did, but to be able to analyse the forces which governed their changing environment (Richard Kaufmann not Banister Fletcher; E A Gutkind not T Alwyn Lloyd). For composition he will substitute space, and learn to use new spatial geometries remote from perspective (Martienssen rather than Curtis). And he will study place and places not maps and plans (Le Play not Abercrombie). Finally, he will leave unopened 'The Planner’s Notebook', scribble on the Hilbersheimer diagrams, refuse to roast on the Hippodamian grid-iron, plough up the Usonian acres, and he will come to study MAN in the light of the things he makes; MAN the carver, the potter, the assembler and the Parthenons, Ronchamps, and Eiffel Towers he builds; he will study MAN the myth-maker, distinguishing him from MAN the icon-builder; Jungian MAN of the four functions, Gestalt MAN and his law of prägnanz, Reichian MAN in his orgone box, Freudian MAN on his way back to the womb. He will see the topology of MAN – the vertical ladder of kinship insecurely balanced on the plane of relationship; he will touch the landmarks on the brief road from Chandigargh to Golden Lane, from Tlaxcala to Wilton; listen to the music of the spheres and hear the ‘sounds of horns and motors which shall bring Sweeney to Mrs. Porter’; taste the acrid dust of falling towers and snuff the bracing air of Skegness; he will have “clambered over old rafters, peering down on the Dronne, over a stream full of lilies” but he will remember that he walks “on the edge of a bricked and streeted sea, and a cold hill of stars”. All these he will study at a ‘University of Building’ offering an education covering the whole field of construction. Its graduates will not struggle to put on only the straight-waistcoat of the R I B A qualification; they will be free to choose – an engineer or scientist does – a functional activity appropriate to their talents. To be an architect will no longer carry the presumptive qualification to design all kinds of buildings – for others to construct – but it will nonetheless indicate a precise and important function within our society.